This pocketbook features a saddlebag type of shape with a flap closure. 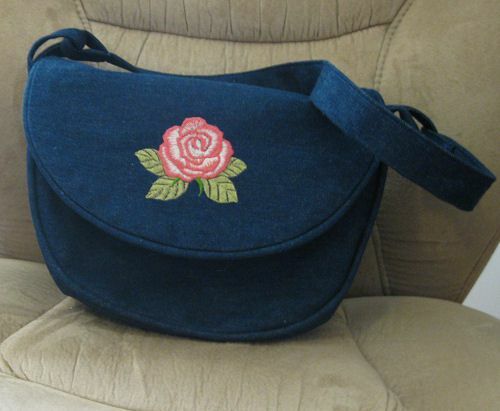 Use machine embroidery, applique, cording or other embellishment ideas to create your own bag using this free pattern. 1/2 yaqrd of fabric such as denim, corduroy or canvas for the outside of the bag. Note: Use the long straight line on the pattern piece as a grain-line and as an on-fold line. Cut one of the pattern piece as it was printed. Fold the fabric and cut one with the long straight line of the pattern piece on the fold. Cut one strip of fabric 4" by 22" for the sides of the purse. Cut two 2" by 8" strips of the outer fabric for the straps to attach too. Cut one 3" by 28" strip for the strap. On the single cut pattern piece -- apply cording to all edges except the long straight edge. In the piece which was cut on the fold, apply piping to the entire edge. Find the crosswise center of the same end, by placing the pattern piece on that end and folding the pattern piece in half. Embroider or applique a design using the curved end as the bottom. Fold the strip in half lengthwise with the wrong sides together. Fold in half again, bringing the raw edges in to the center fold. Stitch along the edges to hold the folds in place. Using the one 3" by 28" strip for the strap. Fold in 1/4" of the short edges with the wrong sides together. Fold the strip in half lengthwise, with the wrong sides together. Fold the raw edges in to meet the center fold. Re-press the original fold and adjust if the edges are not perfectly aligned. Stitch close to each edge of the strap to hold the folds in place. Fold the cut out patten pieces in half on the curved edges and mark the center. Fold the 4" by 22" piece in half (bringing the short edges together) and mark the fold on each edge. Match the marks on the 4" by 22" piece to the outer pattern piece that was not placed on the fold. Pin the edges so the ends of the side piece align to the top edge of the pattern piece. Align the second piece in the same way so that the "cut on the fold', fold, is equal to the top edge of the first pattern piece of the bag. Sew the sides to the pattern piece. Bring the ends of the sewn 2" by 8" pieces to the top of the sides sections on both sides. Align the edges with the front and back of the bag. Baste the strap holders in place using a 1/4" seam allowance. Keeping the main part of the strap outside the strap holding loops, place the ends of the strap in to the loops so the ends are going in toward the bag. Bring the ends up on the inside of the strap about 1"
Sew the ends of the strap to the strap. Repeat the same procedure to join the lining pieces together EXCEPT, leave a 4" opening in the seam at the bottom center of one seam. Place the outer bag right side out. Place the lining the wrong sides out. Place the outer bag inside the lining and align the edges. Be sure to keep the strap holders down along the sides so they do not get caught in the seams. Align the seams and edges. Sew the bag to the lining keeping an even seam allowance along the entire edge, pivoting at the corner to the top flap. Trim any bulk at seams and strap locations. Turn the bag right side out and press the edge where the bag and lining are joined. To help the lining stay inside the bag, stitch through all the layers along the top edge of the bag. Top stitch the flap edge if desired. Fold the sides in toward the bag, matching the edges. Sew a bar tack through all of the layers at the top of the bag, near the fold. Slip stitch the lining closed. Press all edges in place.